Soloists with three (3) or more solos can compete for the Thunderbolt. Top three (3) routines from each age & performance division battle. A chance To dance for fun without the pressure of competition. A "flashover" is the near-simultaneous ignition of most of the directly exposed combustible material in an enclosed area. 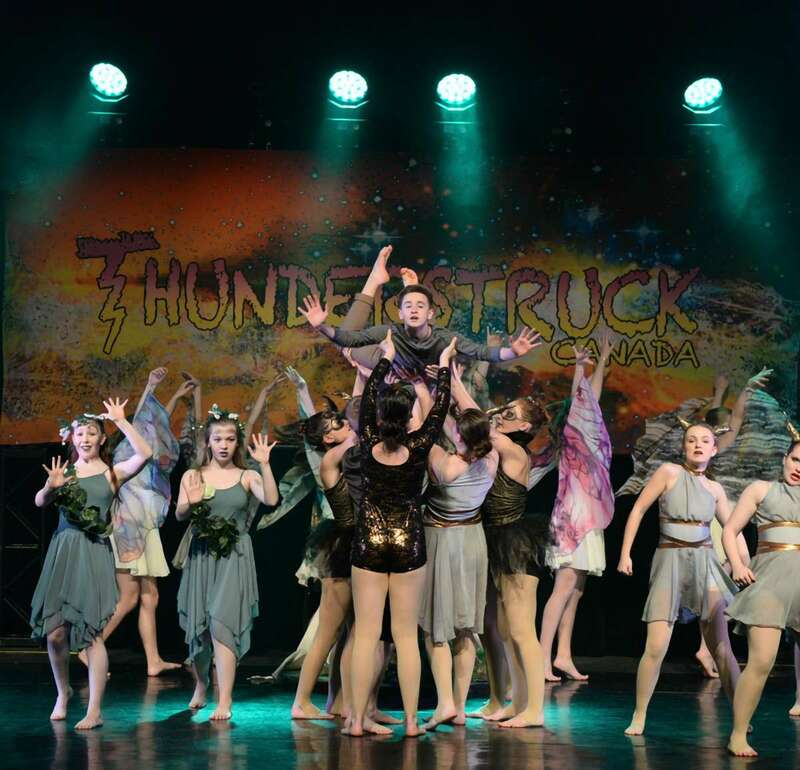 At Thunderstruck Canada, this happens when we combine our Thunderbolt Solo's, Top Group Routine Battles and our Positive Flash Gala, marking the end of the event and culminating with our Eye of the Storm Presentations. The Flashover Finale commences with the Thunderbolt Solos. Soloists with three (3) or more solos compete in this category. With Live commentary from adjudicators, it creates different experience and opportunity for special recognition. The Top Group Routine Battle pits the Top Three (3) groups from each Age/Performance Division against each other, Battle style, to determine the winners for the Top Routine of each section. The Positive Flash Gala is an opportunity to highlight some of the favourite routines from the event with performances for fun. They do not impact the competition. Just a #ChanceToDance for dancers to perform without the stress of competition and patrons to enjoy some of our favourite routines from the event. Our Thunderbolt Solo is unique in the industry and provides an opportunity for dancers with multiple solos to compete in a different category, receive live commentary from the adjudicators and gives the audience a unique perspective of what goes into preparing and competing a routine, into mindset of an adjudicator, and things that can be done to improve. For more information, please visit our Thunderbolt Solo page. We recognise the Top Routines as part of the Eye of the Storm awards. The Solo/Duo/Trio Top Routines are awarded based on the score. For the Groups, there is a little twist, a chance to dance again, and battle for the Top Group Routine honours. Top Group Routine distinction is by Age and Performance Division, so it combines the Small and Large Group sections. In the past, like the Solo/Duo/Trio, it was determined based on the score. A studio can only have one routine per section. The Small & Large Groups from each section are combined to create battles to determine the Top Group Routine for each Age & Performance Division. There needs to be a minimum of 10 routines combined in the Small and Large Group sections for Top Group Routine to be awarded and hence, a Battle for that honour. To make it easy to know if you qualify for the Top Routine Battle in the Flashover Finale, we'll use an elimination style process. Two sections make up each Battle. The Small Group and the Large Group for each Age and Performance Division. At the awards session for the first of the two in that section, we will announce the three routines that qualified for the Battle. We will update that list when the second section dances. It may stay the same, or there might be changes adding to the excitement. The schedule for the Battle will be predetermined. Based on your qualification, you will have a general idea when a routine will Battle. We will update this schedule with routine names as they are confirmed. A "positive flash" lowers a charge to the earth with powerful lightning bolts that carry as much as ten times the standard current and often lasts longer. The purpose of the Gala is to revisit some of the favourite routines from the event to perform for the love of dance. It gives the audience and dancers a chance to enjoy without the pressure of competition. The Positive Flash Gala takes place at the end of the event to kick off the Flashover Finale. It is by invitation. We make every effort to include all studios, however, in some instances, this will be limited based on the size of the competition and time available. We will provide an update to studio directors by email once the schedule is complete. The selection will be up to the Studio Director, or they can opt to have our Competition Director choose for them. The Positive Flash Gala is an opportunity to showcase routines from the competition and is an invitation, so performers are not required to participate. Performance in the Gala is a showcase and will not affect any overalls or studio points.